Get rid of that home office clutter with these free woodworking plans. Suitable for all types of woodworkers. Build or customize the plans to make your next project. 10 Free Woodworking Plans found in the "Home Office" Category. Lee's Wood Projects - How to Build a Wood Desk. This attractive desk is an excellent place to study, pay bills, etc. I has three large storage drawers on the right side, and three smaller top drawers for office supplies. This is a perfect woodworking plan for your home office. 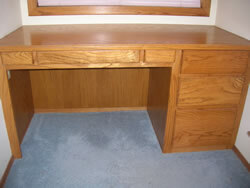 Build this free woodworking plan and keep you home office desk clean and clutter free. Like all plans from the Canadian Home Workshop, this one comes with complete directions, illustrations, and material list to guide you through the build process. This free woodworking plan includes 5 pages full of directions, diagrams, and helpful ideas to build this writing desk. Check out the full color illustration that will help you build this project. The computer workstation has become the "desk" of the millennium. But even the simplest version can cost hundreds or more at your local computer furniture store. By building our version you'll not only pocket big savings, you'll also have a strong, sturdy workstation for years to come.